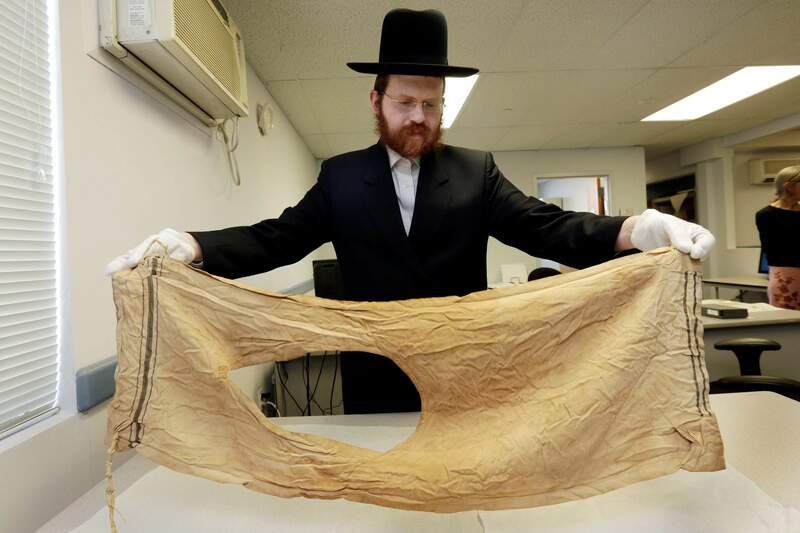 Dovid Reidel, Director of Research & Archive Division of the Amud Aish Memorial Museum, in Brooklyn, N.Y., shows plea for rescue, left, that was smuggled out of France’s Vittel internment camp on a coat lining in 1944, and the 1942 diary of Dr. Hillel Seidman, written in the Warsaw Ghetto, both part of the museum’s collection. The museum focuses on Jewish religious practice and the role of faith during the Holocaust. 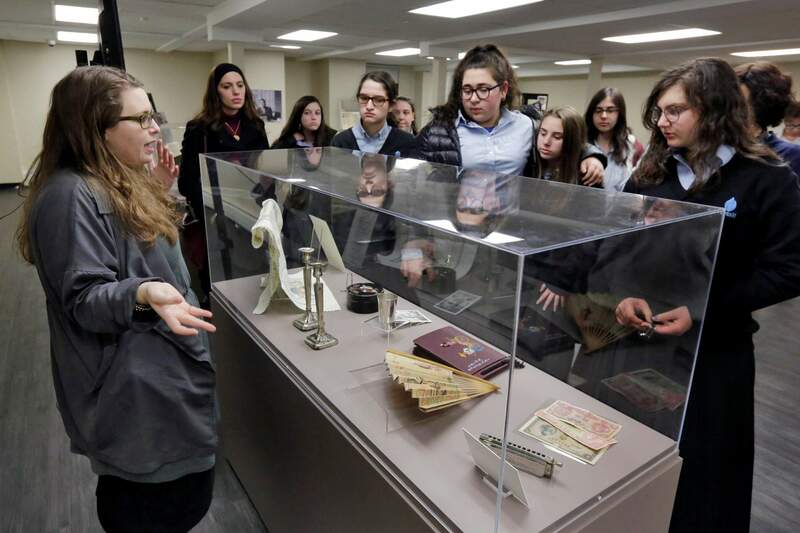 Program Coordinator Miryam Gordon, left, of the Amud Aish Memorial Museum, in Brooklyn, N.Y., leads a tour of the museum’s “Precious Gift: Rescue and Shanghai” exhibit with a group of students from Brooklyn’s Nefesh Academy. The museum focuses on Jewish religious practice and the role of faith during the Holocaust. Director & CEO Rabbi Sholom Friedmann of the Amud Aish Memorial Museum, is interviewed at the facility in Brooklyn, N.Y. The museum focuses on Jewish religious practice and the role of faith during the Holocaust. NEW YORK – Faith and survival, not the machinery of death, are the central themes at an atypical Holocaust museum in Brooklyn. The three-year-old Amud Aish Memorial Museum, located far from the tourist crowds at near the very edge of the borough, focuses on the experiences of Orthodox Jews during and after the Holocaust. Its collection includes letters, diaries, photos and religious items, like a frayed prayer shawl worn secretly by a prisoner at Auschwitz. Many were donated by Orthodox and ultra-Orthodox Jews who had stashed the artifacts in basements and attics would not have given them to another museum, Amud Aish staffers said. Dovid Reidel, Director of Research & Archive Division of the Amud Aish Memorial Museum, in Brooklyn, N.Y., holds a talit, or prayer shawl, part of the museum’s collection, that belonged to Mendel Landau, in 1944, of Auschwitz, Poland. The museum focuses on Jewish religious practice and the role of faith during the Holocaust. The collection includes the Warsaw Ghetto diary of Hillel Seidman, who wrote about Jews’ daily struggle to survive and to practice their religion in the face of horrific persecution. Currently housed in a temporary space downstairs from a home health care company, far from city subway lines, the Amud Aish Memorial Museum has long planned on moving to a more prominent location. 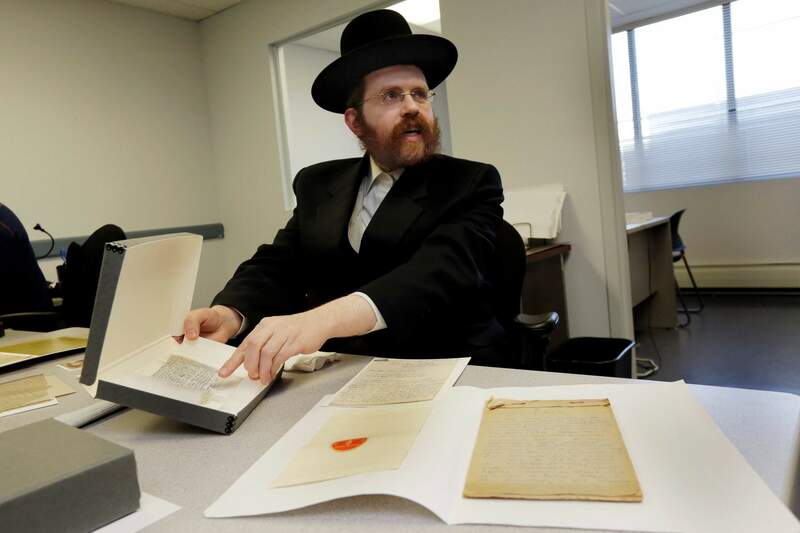 When it opened in the remote Mill Basin neighborhood, there were plans to build an $11 million permanent museum in the borough’s Borough Park section, home to a huge and growing population of Orthodox Jews. Sholom Friedmann, the museum’s director and CEO, said there’s now no fixed date for a move. An exhibit that officially opens at the museum later this month tells the little-known story of thousands of Jews who found refuge in Japanese-occupied Shanghai, China. 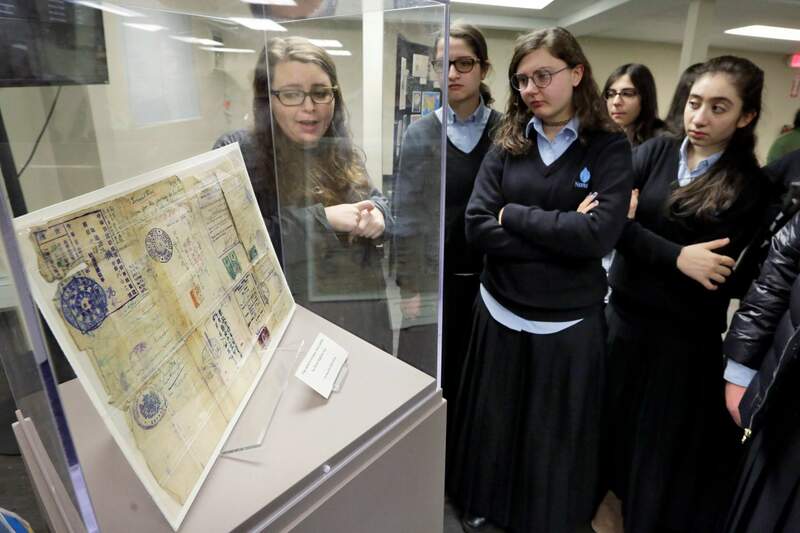 A group of teenage girls from a private Jewish school clustered around the vitrines during a recent visit and learned about the Walkin family, who fled Lithuania on the Trans-Siberian Railway in 1941, landing first in Kobe, Japan and then in Shanghai. Program coordinator Miryam Gordon pointed out sabbath candlesticks adorned with Chinese characters. 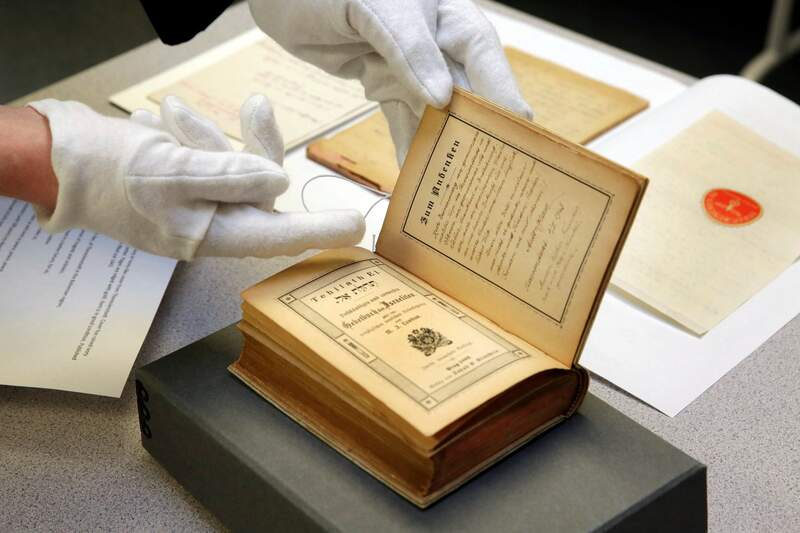 Dovid Reidel, Director of Research & Archive Division of the Amud Aish Memorial Museum, in Brooklyn, N.Y., displays an 1893 prayer book, part of the museum’s collection, that was retrieved by a U.S. soldier from the Theresienstadt concentration camp in Czechoslovakia during World War II. Currently housed in a temporary space far from city subway lines, the museum is hoping to move to a permanent location. Reidel’s own grandfather, Mike Tress, is featured in Amud Aish’s collection for his work trying to secure passage for European Jews to the United States or another safe haven. Colleagues in Holocaust remembrance said there’s a place for a museum that’s devoted to the devout. “The more opportunities there are to engage with Holocaust education, the better,” said Elizabeth Kubany, a spokeswoman for the Museum of Jewish Heritage - A Living Memorial to the Holocaust, located in lower Manhattan. 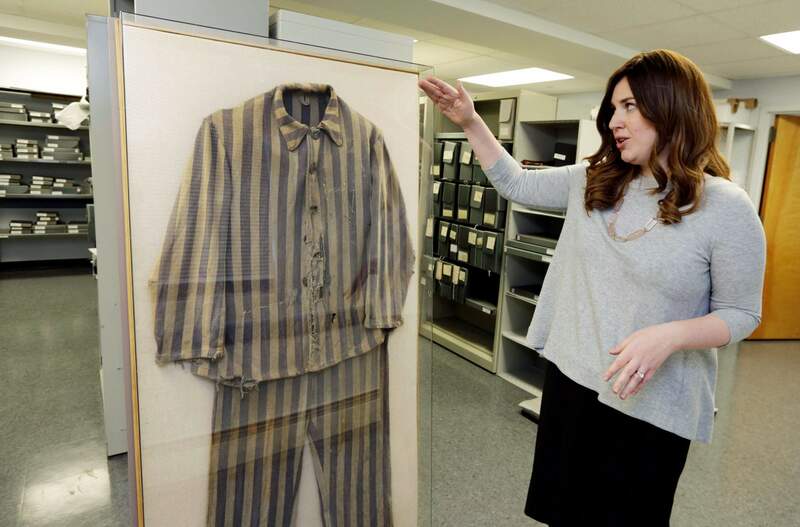 Director of Collections Shoshana Greenwald at the Amud Aish Memorial Museum, in Brooklyn, N.Y., talks about the 1945 uniform of Bergen-Belsen concentration camp survivor Chaim Schmidt, in the museum’s archive room. The museum focuses on Jewish religious practice and the role of faith during the Holocaust. Tova Rosenberg, the creator of the “Names, Not Numbers,” a Holocaust oral history program, said Amud Aish shows the “spiritual resistance” of Jews who maintained their religion even in the concentration camps. 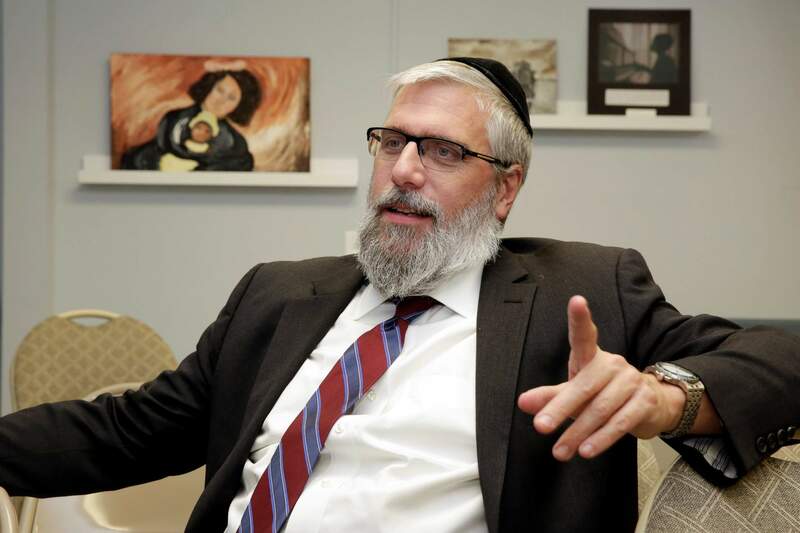 Michael Berenbaum, a Holocaust scholar who has served as a consultant to Amud Aish and other museums, said he hopes Amud Aish can reach its core community while also attracting a broader audience that may have little contact with the Orthodox beyond passing them on the street. “I would hope that lots of non-Jews, non-Orthodox Jews would come to see it in part as a bridge to understanding with these people they live adjacent to,” he said.